Mix the Pumpkin, Onion, Olive Oil, Sesame seeds, Salt, Sumac, and Thyme together and place in a tray, spaced out evenly. Cook for 45 min. When the Pumpkin mix is cooked, put it to one side to cool. Sprinkle Pine Nuts onto a tray, then add Haloumi. Cook for 20 minutes, turning Haloumi after 10 minutes. Scatter fresh ingredients on a plate, scatter the Pumpkin mix over them, then pine nuts and top with the Haloumi. 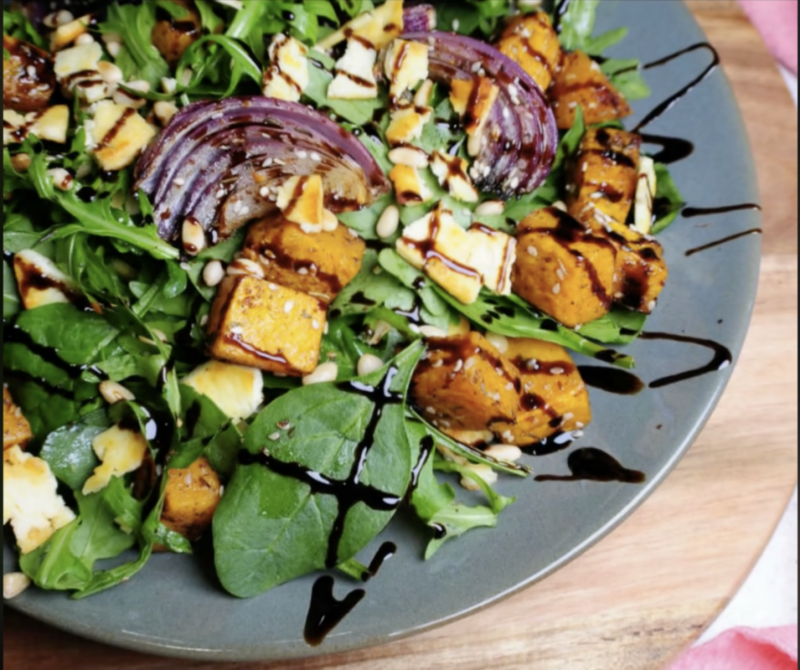 Drizzle the Caramelised Balsamic Vinegar over the salad and serve. Great with Crusty Sourdough Bread!